My son asks to listen to Ms. Gillian's podcast almost every day. He loves the stories and songs, and I love the quality time we spend listening together. Thank you for visiting Listen Together Podcast. Our members receive FOUR new Listen Together Podcasts every month with a subscription of only $35 for 6 years of access!!! Each podcast is an audio recording with songs and a story. Our sample month is free and is all about rabbits. Enjoy! Crispy Crow will come and visit us every now and again, bringing something special to share with everyone, whether you subscribe to the Listen Together Podcast or not. So be sure to visit regularly, as there might be something new! I hope you enjoy the activities. This music is for Spruce Room recorder players. ACTIVITIES FOR EVERYONE TO ENJOY! Here are the lyrics and suggested actions to the song “Five Little Snowmen” from the second February podcast. Look out the window, see our men made out of snow. Five little snowmen standing in a row. And one little snowman melted clean away. I have also used this song with a group of children where five children are the snowmen, one is the cloud and one child is the sunshine that goes around the snowman who melts. With a big group of children, the rest can perform the actions above, showing melting just with their hands rather than their whole body. It is very popular. You can download, print and color a pair of mittens. I wonder what your mittens will look like? If you listened to the story in the podcast MITTENS, you know Flora’s old mittens were green, but she chose something different for her new mittens. Send me a picture of the mittens you color. I would love to see what YOU choose. Up, up, up the Maple tree the little grey squirrel ran. 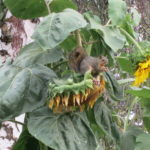 Down, down, down the Maple tree the little grey squirrel ran. Can you think of a different kind of tree to put in the song? 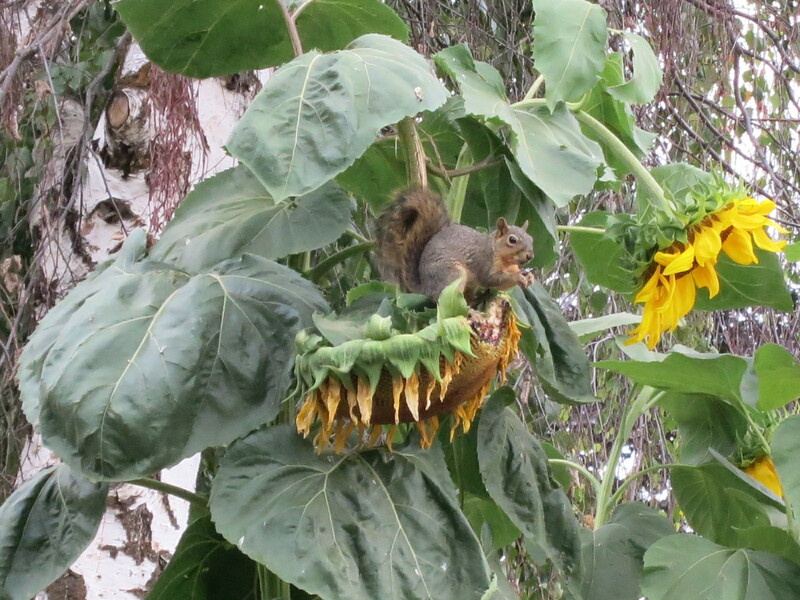 Here’s a picture of the squirrel and the sunflower that inspired the podcast called SQUIRREL. Anneliese sings the first part of a song on this podcast. Sing along, and then think of some different flower names you can sing. Just click on the arrow. In our last podcast for September, Alex and Bethany sing about a grandfather clock. Here is a picture of one. You can download it and color it if you like. Here is a song from one of the podcasts for September. Teri sings “Rain, Rain, Go Away” and then you can put your own name in the song. Do you know how to play “red light, green light”? If you don’t know, here are the instructions. Here is a science experiment for you to try.